For those of you who unfortunately were unable to attend our AGM on 23rd April and those who are interested in what is coming up for us in the future, here is our 2017 Annual Report. If you would like more information please contact us at membership@revolver.coop. Revolver ® have for the second year been winners in The Great Taste Awards. Revolver ®World Fairtrade ® Arabica Brazil judges said was “a good example of a strong, dark roasted coffee”. and Revolver World are winners again, for the second year for Fairtrade ® Ethiopia Yirgacheffe which judges said they “unanimously and immediately agreed (upon)”. About the Fairtrade ® Brazil; “There are pronounced nut flavours present in this powerful espresso, smooth and very woody. Good example of a strong, dark roasted coffee”. The judges said about the Revolver World Fairtrade coffee ® Ethiopia “we really like this coffe…it has an immediate nutty refreshing flavour…a well – balanced coffee, well made and we unanimously and immediately agreed it deserves one star”. The Great Taste Awards are created by the Guild of Fine Foods. Although many coffees are entered into the awards, there are comparatively few winner and only a small percentage are Fairtrade coffees. John Boyle Chair “it’s the people behind the scenes who make the magic happen, the credit goes to the farmers and their co-operatives who care-deeply about the product and our co-operative colleagues in stores, who make everything simple for shoppers“. Revolver ® were awarded the Fair Tax mark earlier in the year (the first Food / Beverage company working in commodities) and just the 20th firm in Britain to receive the award. In 2015 Revolver was awarded the Living Wage Foundation certification and was the 6th company in Birmingham to receive the cities Social Responsibility Charter (now over 300 firms hold the charter mark). Revolver ® is organised as a multi-stakeholder co-operative, members include producers in the developing world. It ranks second for ethics as judged by Ethical Consumer magazine. Please bear with us as we develop the site. We are working our way through various pages, bringing them up to speed. A Record Executive who famously signed The Stone Roses has been honoured by the University of Wolverhampton. Paul John Birch, founder of Revolver Records, was awarded Honorary Fellowship from the University in recognition for his contribution to the Record Industry at a ceremony at The Grand Theatre on Monday 21 September 2015. Birch completed Sony’s executive management training programme in New York and studied business at Kellogg, Ivey, Aston & Wolverhampton (where he completed his MBA) business schools after working as a plugger for artists such as The Eurythmics, Steel Pulse, ELO, Barry Manilow and Genesis. In 1979 he launched Record label’s Heavy Metal Records and Revolver Records. The label’s signed artists including The Stone Roses, The Scorpions, UK Subs, UFO, Diamond Head and Jane’s Addiction and has released 4,500 albums including Sister Sledge’s “Greatest Hits” and Magnum’s “On a Storyteller Night”. Birch: “I am delighted to receive this honour from The University, I don’t come from the glossy X-factor Simon Cowell music made for TV sector. I looked for inspiration to Anthony Wilson at Manchester’s Factory Records and a time when the lyrics of artists had something to say about social change. My concern is for Graduates transitioning into work. Graduates need to grasp technological change and innovation, but be inclusive and keep an eye on those around them that need a hand-up”. In the past 35 years Revolver was distributed by PYE, Decca, PolyGram, EMI, BMG, Sony and Universal, with offices in both Notting Hill & Hannover, Germany. Birch Chaired The British Record Industry’s (BPI) Education & Training Committee & International Committee 1990‐2007. He created the British Record Industries export strategy by creating The British at Midem & British at SXSW pavilions and led the 2001 British retail campaigns with both Virgin Megastores America, & HMV Japan increasing the UK industry share of World markets. He served on the Phonographic Performance Ltd main board and was then elected to both the main board of IFPI (International Federation of the Phonographic Industries) and its European Executive Committee, becoming World Independent Representative before retiring in 2007. Outside his career, Birch has been a justice of the peace in the West Midlands since 1999, chairing the region’s victim & witness support unit. Secretary of FAIRTRADE Birmingham and a former governor of Wolverhampton Grammar School until 2007, he has lectured on international business strategy at UK universities, including Wolverhampton, Manchester Met, University of Birmingham, University of Gloucestershire, Liverpool University and Liverpool Institute of Performing Arts. For more information please contact James Allen in the Media Relations Office on 01902 322003. •	Based at campuses in Wolverhampton, Walsall and Telford and education centres in Stafford, Burton and Birmingham City Centre, the University has over 21,000 students and 2,400 staff. In addition, the University of Wolverhampton Science Park is home to tenant businesses and supports the development of innovative companies. •	The University welcomes students from around the world and has regional offices in China, Malaysia, India, Oman, Nigeria and Cyprus. It has a branch campus in Mauritius and courses are also delivered with global partners in China, Hong Kong, Singapore, Malaysia, India, Sri Lanka, Russia, France and Cyprus. •	It is investing £250 million over the next five years as part of the Our Vision, Your Opportunity programme. The ambitious plans to invest in education, training and economic growth include the £25 million Rosalind Franklin Science Building, the new £18 million Lord Swraj Paul business school building and the £65 million Springfield Campus, creating an international hub for construction excellence. •	The institution’s excellent teaching and learning provision, which spans sciences, creative and performing arts, education, business and management, health and wellbeing, engineering and technology, law and social sciences, ensures 95% of graduates find employment. •	Of the 13 subject areas entered in the Research Excellence Framework (REF) in 2014, all had elements graded at the highest level as being world class. The University also entered more staff and more subject areas for assessment than previously. •	In 2015 the University of Wolverhampton was awarded the highest possible accolade in the Quality Assurance Agency (QAA) higher education review. The report highlighted areas of good practice such as initiatives to raise aspirations and achievement for students and the University’s commitment to enhancing their employment prospects. •	Revolver Records was created in 1979 and to-date has released 4500 albums. The label has employed 500 staff during its existence. It operated offices in Hannover Germany until 1992, recording studios in Wolverhampton1991 -2001, and a press office in Notting Hill until 2002. •	Revolver Co-operative was created in 2010 – and is organised as an Industrial & Provident society with 50 members. The society is a “multi-stakeholder” co-operative and supplies Fairtrade only, certified commodities such as ground coffee under its “Revolver World” brand, into around 350 branches of The Co-operative Food. In 2015 it started exporting into Estonia and Poland. Lunch will be served members will leave with our goody bags. *NB Under Rule 35 all 6 serving Directors retire at the close of the Annual Meeting but are are eligible to stand for re-election. Rule 34 provides that the Board may comprise a maximum of 15 Directors. Nominations for Directors will be accepted from members at the Annual Meeting, or in advance if addressed to The Secretary at the Registered Office. Meeting to close by 2pm. We would encourage members to stay on for the Co-operative Press AGM at 2.30pm which will include a debate on how to balance co-operative values with business. Revolver Co-operative Limited. Registered No. 31024R. Registered Office: 152 Goldthorn Hill, Penn, Wolverhampton, WV2 3JA. Our new range of Syrups have been created by John Taylerson of Malmesbury syrups. We have three 250ml bottles, priced at £2.99 retail on launch; Hazelnut, Vanilla and Caramel. These syrups are produced in the Cotswolds and are aimed at Customers who have tried syrups with coffee in coffee shops and want to reproduce that experience at home. The syrups can be used in a variety of recipes, not limited to coffee. Patrice Garrigues is behind the project, Patrice has been asking us to do this for three years. Distribution will be with AFBlakemore Fine Foods (Formerly Heart). 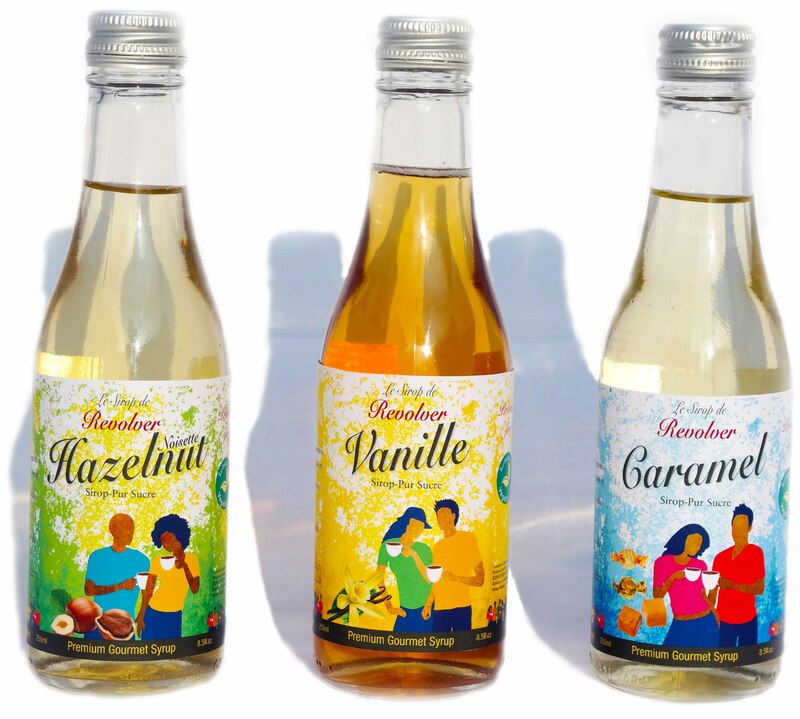 We expect these syrups will be popular as there are few supermarket ready syrups produced in the United Kingdom the market leader is Monin the french food company, who provide the majority of syrups used in catering. For restaurant enquiries, please contact us at coffee@revolver.coop.